Iconic photo, by Dutch-national photojournalist Hubert van Es, depicting individuals trying to leave Saigon by helicopter on April 29, 1975. The chopper had landed on the roof of Pittman Apartments, located at 22 Gia Long Street. Copyright, UPI, all rights reserved. Image of iconic photo provided here as fair use for educational purposes. The fighting, of course, didn't stop when America left Vietnam. By March 13, 1975, North Vietnamese troops were 35 miles north of Saigon. People from the South fled with their injured children. Roads became massive traffic jams. On March 29, 1975 the communists from the North were closing in on Da Nang. By April, people tried to board helicopters transporting fleeing refugees to safety. Mobs, hoping for a seat in a chopper, showed up at the U.S. Embassy. Americans were also trying to get out of the country before Saigon fell. Sometimes a fist to the face was part of the door-closing process. Bombs fell on the capital city as people scoured the ruins for survivors. Saigon fell on April 30, 1975 when North Vietnamese soldiers took over the Presidential Palace. On the same day, troops overran Tan Son Nhut (sometimes spelled Tan Son Nhat) air base. Today Saigon, the former capital of South Vietnam, is called Ho Chi Minh City. Hanoi, the former capital of the North, is now the seat of government for the unified country. "Vietnam vets," those Americans who fought in the war, returned to a divided country. (Scroll down on the links to hear popular music of the time, including the timeless For What It's Worth.) Many wondered how it was that fellow citizens (who never had to risk their lives) had "the guts" to scorn them. Drafted veterans had not asked to fight. Many did not want to go "to Nam" in the first place. Others joined various branches of the military because they were motivated by idealism and a sense of patriotic duty. But for the first time in the history of the nation, thousands of Americans were contemptuous of fellow citizens who went to war at their government's command or behest. The country's collective anger about Vietnam was directed more at the people who fought than at the politicians and military leaders who ordered the fighting. Well, I had to take this fellow's body to his wife - she was nineteen years old... I was helping the mortician take the casket out of the hearse. Of course I was in my dress uniform, medal and all that, and the American flag was over the casket and some guy walked by when we had it about halfway and the fool spit on it and said, "Good, he deserved to die." 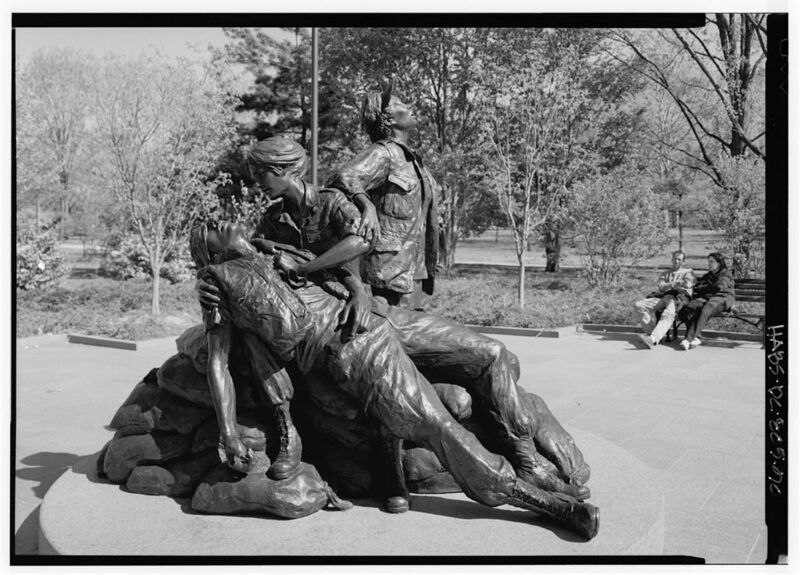 Not until later, after the veterans themselves built "The Wall" with private donations, did Americans really show support for the men and women who endured the unpopular struggle in Vietnam. Today, the Wall has become a sacred place. Filled with the names of all 58,219 who fell, written in their order of sacrifice, it is often the site of grief and tears. It is where those who survived can speak to those who died. It is the spot where one can honor the memory of a buddy by leaving a memento that only had meaning between friends. And ... more than anything else ... the Wall represents what Americans finally learned. A nation, if it is truly great, neither scorns nor disgraces the people who respond to their country's call. Bos, Carole "THE FALL AND THE WALL" AwesomeStories.com. Nov 01, 2001. Apr 18, 2019.